Haitian-Japanese US Open Tennis champion Naomi Osaka is coming to Haiti on November 6 2018 for a short vacation and to visit some Haitian tourist attractions including the Citadelle, her Haitian father said. This will be the second Naomi Osaka visits Haiti this year in the last 12 months. She was here back in October 2017. Osaka's father Leonard Francois came to Haiti over the weekend to prepare for her daughter's visit. 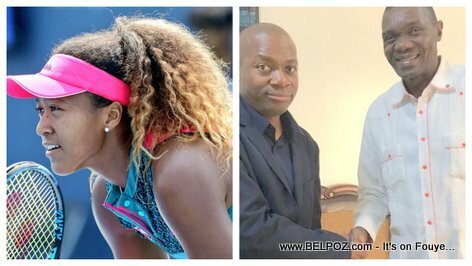 Naomi Osaka will be in Haiti for 4 to 5 days before she head to the Australian open, her father said. "She will take advantage of her few days of vacation to spend 4 to 5 days in Haiti," he said. "I would very much like her to have fond memories of the country. She will visit the tourist sites that are related to our great history of people, including the Citadelle Laferrière. This will allow her to have an idea of the history of Haiti. She will taste of course the Haitian cuisine that she loves so much," her father said. During her visit, Naomi Osaka will visit a training center financed by her foundation in Jacmel. "We started this kindergarten 20 years ago, we are also introducing children to tennis, Naomi visited the space last year, it has just been enlarged and my daughter will take part in the new grand opening. the idea is that she gives back to Haiti what she has received to enable young people to move forward." Wonderful news! All my compliments to Naomi and her beautiful family for giving a shot out to my country of Haiti.